SR: Dave, growing up in Manchester in the 60’s, were you a City or United fan and did you have any footballing heroes at the time ? DB: Well I was a schoolboy with Coventry City for a long time, but in the end they decided that I was not good enough. When I began as an apprentice professional at Blackpool I was a Manchester United fan, and still am, behind my beloved QPR. SR: After signing professional for Blackpool in 1982 you moved on to Watford and then Oxford United. Was it a surprise when Trevor Francis came in for you in September 1989 ? How did it come about ? DB: Yes somewhat. I had a good spell with Oxford and, well, one evening Chris Geiler called me and asked if I would be interested in joining QPR, only one answer there ! SR: You made your debut at Loftus Road later that month against Derby County, but not at right-back. What do you remember about that game ? DB: Nightmare, I did not like the wide-right position at all. DB: Yes big Macca flicked it on and I got the touch. SR: Trevor Francis was criticised for the way he handled some of the players and was sacked in November. Don Howe stepped up, considered an astute tactician ? What did you think of him ? DB: Don was just fantastic, an amazing coach and a great man, truly great. I was upset for him when things changed and he left. We did quite well under Don. SR: We finished around mid-table, but Rangers had a good FA Cup run that season. There was the replay against Arsenal when Kenny Sansom scored against his old club, the three matches against your former club Blackpool before finally going out to Liverpool at Anfield in the replay. DB: Yes, the game v Liverpool, we were unlucky, we had a good run and things started to change for the better around this time. 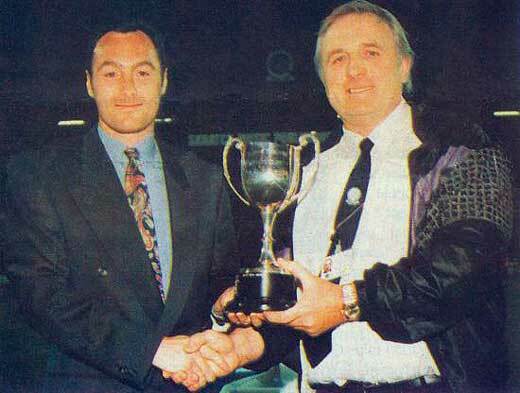 SR: Gerry Francis was appointed in May 1991 in place of Don Howe. What do you recall from that time ? DB: Yes, I remember seeing Gerry in the players bar after the Arsenal game, soon to realise I would play my best ever football under his leadership. I cannot say how respectful I am of Gerry and all he did for me. SR: Your next two goals came during cup competitions in the 1991/92 season – scoring our first goal in a 5-1 win over Hull City in the League Cup and another in the Zenith Data Systems Cup against Palace. DB: Yes I remember, I had quiet games ! SR: 1992/93 and the Premier League. Rangers were London’s top club finishing in fifth place. Two of the games that stick out for me were the 4-1 win over Tottenham and the 5-3 victory at Everton in which you scored. What memories do you have of that season and your three goals ? DB: Well right now I can only remember that we did so very well. Our team then was joined with the fans and we all felt what was needed for the club, ourselves and the fans. The connection with the fans was amazing and friendships grew and grew as we played our hearts out. I think we pounded everyone, win or lose. I think that year I was voted top right-back in the Premier League. A nice thing to win at the PFA awards. SR: Did you have a pre-match ritual or any superstitions and did your team mates have any unusual ones that you can tell us about ? DB: Not really, I always carried a ball out. I really don’t think the team did, just hard words before we went on the field. SR: You were voted Player of the Year in 1994 Dave. DB: Well all my thanks go to the fans who gave me so much pride and support after my nightmare start at the club. SR: Ray Wilkins began his reign as player-manager, a popular choice at the time and he got us off to a decent start when he took over from Gerry. Despite another change, did it help bring any sense of continuity to the players ? DB: Well, I was not happy when Gerry left. Yes Ray was a great man also and he helped me play to my maximum. We all respected Ray and tried our best to do well for him. Think we beat Arsenal 3-1 at their place, still great times. SR: Whatever sense of continuity there may of been, the next few years saw a number of changes at the club. There was the unusual situation of a reversal of roles when Stewart Houston came in with Bruce Rioch to replace caretaker manager Frank Sibley. They were sacked early into their second season and reserve team manager John Hollins took charge briefly until Ray Harford was appointed. DB: For me the club within lost its true soul just before Johnny Hollins, and then again after Johnny. I was injured for a long time and could see it all changing, as my heart started to sink. Mistakes bringing none-QPR style players to the club, errors bringing in the wrong coaches. QPR is a club that did well from within, people who understood what the fans wanted, coaches like Gerry, player, loved the club, once it went outside many things were lost.¬† All the best young talent moved on. SR: Relegation in 1996 and we just managed to stay up in Division One in 1998 courtesy of that legendary own-goal from Jamie Pollock. What did you say to him Dave ? DB: To be honest I can’t quite remember that own goal, but yes we were lucky to stay up. SR: There must of generally been a great team spirit at the club for much of the time and there have been a number of stories circulating of wind-ups and pranks involving you and Macca. Was it you or Andy Sinton that ended up manacled to a ball and chain ? Also I understand that the players eventually got their revenge on Macca in the dressing room ? DB: Well Macca and the guys chained me to a ball and chain, last game of the season one year. I sat in that shower for ages freezing my arse off ! Revenge was right there the following year when we handcuffed Macca to the shower all night…many great moments. Macca handcuffed himself to Andy all night so he could not drive home. Even the fans were involved in those days, best days ever, even the chairman sometimes. The club was just joined all round, anything went, until we crossed the line to play. SR: Did any of these pranks ever involve opposing players Dave ? DB: Not that I can remember. SR: You returned to Blackpool in July 1998 after nearly 300 appearances for the R’s and later there was a rumour that you almost re-signed for us ? DB: Yes I came back, but could not shift a problem in my groin, so I just got on with some other things….was very sad really. SR: Your first full cap was against Spain in September 1992, what memories do you have¬† of that match ? DB: Well I was very excited about it all, but it did not last long as I ruptured my ankle ligaments and limped off. SR:¬† Then the following year you played in a 1-1 draw against Poland in Katowice. Did you feel that you were unlucky not to be in contention again ? 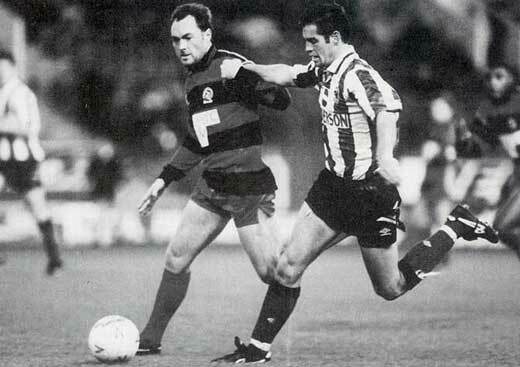 DB: Glen Hoddle said that I was the best player on the park that game, so was happy there. I called home when I found out I was not playing v Norway and spoke to Frank Sibley who I trusted so much. He was my coach and I needed him to tell me I did ok. I felt I did very well and fitted in. I felt it very disheartening to be left out as I felt I was one of two good right-backs in the Prem at that time being consistent. But I had the most important thing, my club to play at. SR: Northwich Victoria was your final club. How soon after that did you get involved with Ajax’s Academy in Florida ? DB: Well in 2004 I started some relations with Ajax Amsterdam and the American things followed on from there. SR: You were involved with them for a few years which must of been a great learning curve for you. DB: I learned so very much from coaches, a different way forward and without doubt their Academy structure is world class. I enjoyed being Academy Director for a few years. SR: I listened to the interview on ‘Open all R’s at the end of last year and you mentioned that you then started up an ‘unofficial’¬†Queen’s Park Rangers Academy after they had left. How did that come about and why QPR Dave ? DB: Well, they left to concentrate on Ajax Africa. I was going to come home, but decided to set up the QPR Academy USA. It’s been going since 2006, I’ve had no funding from anyone bar a few friends otherwise we could not even of moved one foot forward. We have worn the QPR kit from Car Giant to Lotto, Gulf Air, and even today getting our Lotto kits is very hard, very hard. 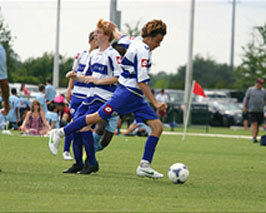 We travelled America marketing QPR, hundreds of QPR fans have watched us at the Dallas Cup and played at the same venues that the teams from Man City send over that won the Milk Cup, to the likes of Tigres from Mexico, Liverpool, AC Milan. We were competitive, very. SR: Apart from being very competitive, you also said how successful it has become and that you were anxious to have an ‘official’ link to QPR. Has there been any progress Dave ? DB: Yes, we need help now. To further our plan I need a real affiliation with QPR. We have developed 32 national team players over four years, nine boys signed professional in four years, all done flying our QPR flag. The budget we need for one year is like two weeks wages for one QPR player, or players, so I will try to further my contacts there. Help is always needed, but right now we need new kits in some ways…. SR: I hadn’t¬†realised the deep affection that you had for QPR Dave. DB: Well to say that I love my club is an understatement. My twins, my eldest, are all massive R’s, and all my friends who support QPR, and now so many more people love QPR over here because of our work. SR: Lastly Dave, have you come across Rodney Marsh in Florida and do you have a message for the Rangers fans reading this ? DB: I owe the club and the fans the best playing years of my life and I deeply admire all true QPR fans. It is they who are the true legends to me. I am thankful that I could play for our great club in such great times in the main. My wish is to come back one day for the Academy post or the Chief Scout post. SR: Many thanks for your time Dave and good luck with the Academy. Great Full Back for the R’s was David Bardsley. This is a very good in depth Q&A. Well done to all involved. Although I never met the player himself I did for a short while work with his Father at a Financial services company in Manchester circa 1990. He was a great bloke to know and I believe was once a non league footballer himself..Altrincham?? He sounds like a man of great gratitude and it is nice to hear him speak so fondly of Don Howe, Gerry, Ray and Frank Sibley. It is easy to forget how good David Bardsley was as he played with so many other good players; he is one that we all took for granted as he was so consistent. A quick look on You Tube shows that he was one of the best crossers we have ever had, but doesn’t really show how good he was as a defender. He deserved far more England caps than he won. A great reminder of better days and so good to hear that he is still a fan. Top player, top bloke. Thanks for the interview. Riveting interview and it has really disturbed me reading about the things we’ve lost. A superb player who did not win the honours he deserved. The comment “right now we need new kits in some way‚Ä¶” sums up our club at present. Within a few weeks the current seasons shirts will be being unloaded for a tenner from the club shop. How hard would it be for 4 sets of kit, 2 home and 2 away, to be sent to Dave in Florida? I went to school with David, caught the bus with him on Altrincham road to school, always had style, great footballer at a young age, played upfront, scored goals for fun, we always played with a tennis ball in school playground, you get skilful, David mastered that art.